Stereotypically, elite athletes migrate towards the field of orthopedics, but one former NFL player has pursued a career in ENT. 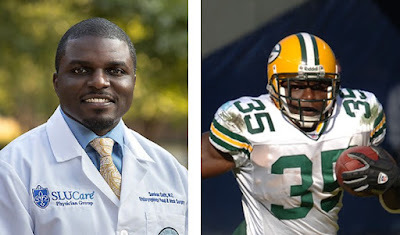 Samkon Gado, MD is currently a second year otolaryngology - head & neck surgeon at St. Louis University Medical Center. He formerly played for Kansas City Chiefs, Green Bay Packers, Houston Texans, Miami Dolphins, and St. Louis Rams. He went to Liberty University for his undergraduate education followed by Medical University of South Carolina for medical school before ending up at SLU for otolaryngology training. You can see his profile at SLU here. Press release regarding his new career can be found here. SLU coverage of his accomplishments can be found here. He stated his intention to potentially sub-specialize in the fields of either neuro-otology or facial plastics and reconstruction. Good for him and hopefully more elite athletes follow in his footsteps! Compared to orthopedics, ENT as a whole has very few former pro-athletes. Quite paltry in fact. The only other former NFL player who is an ENT that I know of is John Frank, MD who used to play for the San Francisco 49ers in the 1980s. He is now a hair restoration expert working at the Anapelli Hair Clinic.